You can eat a burger in a lot of places in Denver. If you travel, you can eat at a lot more burger joints in even more places; in the U.S., there are over 50,000 restaurants making most of their money serving them. You eat the classic beef, or chicken, turkey, ham (or its famously named sliced-from-the-can counterpart), and burgers comprised of grains, seeds and nuts. But it’s not a 5280 Burger unless you are eating here. Our restaurants are well-lit so you can read the menu, but not so bright it hurts to stagger in after a long night of dancing on tables and drinking on the floor. Our chairs support the tired and hard working souls coming in after a tough day in the office. The decor is brick, wood, glass and color; designed for adults but also welcoming to children. Service is prompt, personal and prepared to do whatever it takes to satisfy a customer. Local handcrafted beer and other adult beverages based on what’s fresh and seasonal. Innovative appetizers ranging from tuna nachos and house made pretzels to cheeseburger egg rolls. Salads based on what we personally choose from the local markets and farms, and turn into bowls based on tacos, kale, strawberries, cabbage and spinach, with cheese, nuts, seeds, house made dressings and beef, chicken, lamb or bison added for meal-sized satisfaction. And there’s dessert: house-churned ice cream in seasonal flavors. You can eat whatever you want, but there’s no such thing as no room for our desserts. 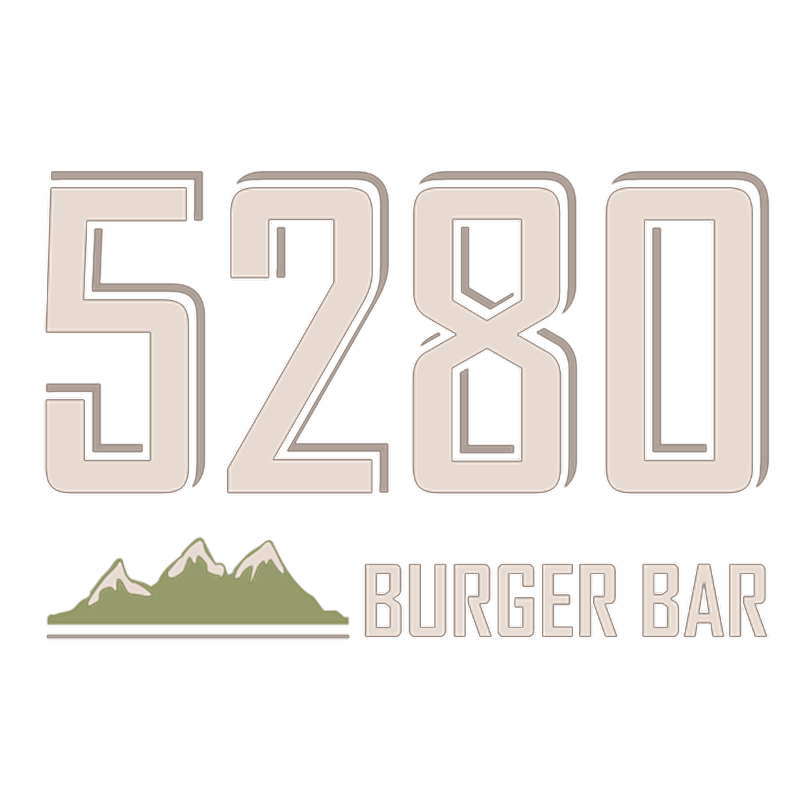 5280 Burger Bar is informal, relaxed and casual. But not paper-plate casual. Our chefs know you eat with your eyes first. Our mission isn’t great food too pretty to eat, or tiny portions artfully carved and painted onto the plate. We want every customer to appreciate their meal as something the chef prepared just for them, because that’s exactly how we think. We seek the best ingredients and most flavorful preparations, so even a simple-looking basket of crispy Brussels sprouts or scoop of Belgian chocolate ice cream in a waffle cone becomes exactly what you want to eat right now. We source all our meats locally and know the source of every slice of cheese, every mushroom and leaf of lettuce on your burger. Our toppings range from classic tomato, onion, lettuce and pickle to fried onion straws, bacon onion jam, pulled pork, hot peppers, marinated cucumbers and our Ring of Fire sauce. Our quinoa and tuna selections satisfy non-meat eaters, and appetites bigger than our plates are welcome to add toppings and extra burgers. Our buns are baked in house and we know they can handle it. Come in to our Denver or Westminster locations; you’ll welcome the atmosphere and you’ll wish the food was this good at your house.